Easy operation, extraordinary experience! 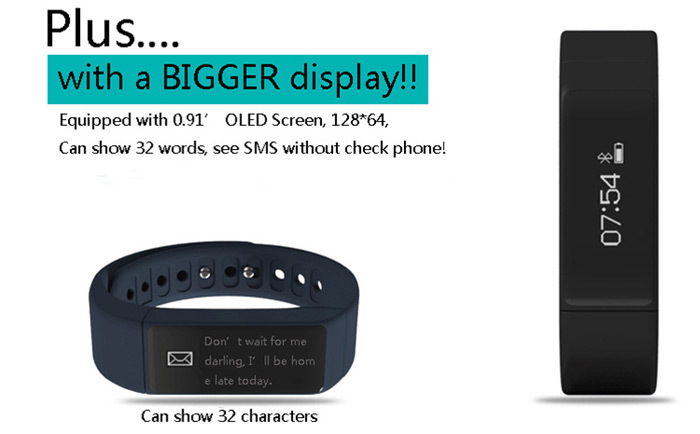 You just need to turn over your wrist or touch the screen to switch the interface;Personalized display function 0.91 inch OLED touch screen can show 32 characters in large font. 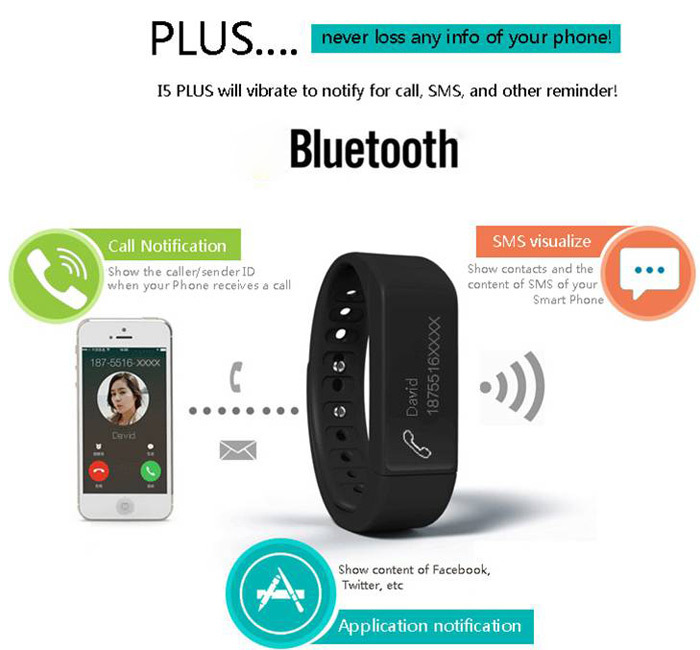 With I5 Plus on your wrist, you can know who is calling and who sent message to you etc..
Data Synchronism The bracelet will sync data automatically after connected with phone by APP (Zeroner), the bracelet time will be calibrated as same as the time of phone. Data Synchronism includes: Steps, calorie, distance. You can check if the data synchronism is completed successfully on the APP. 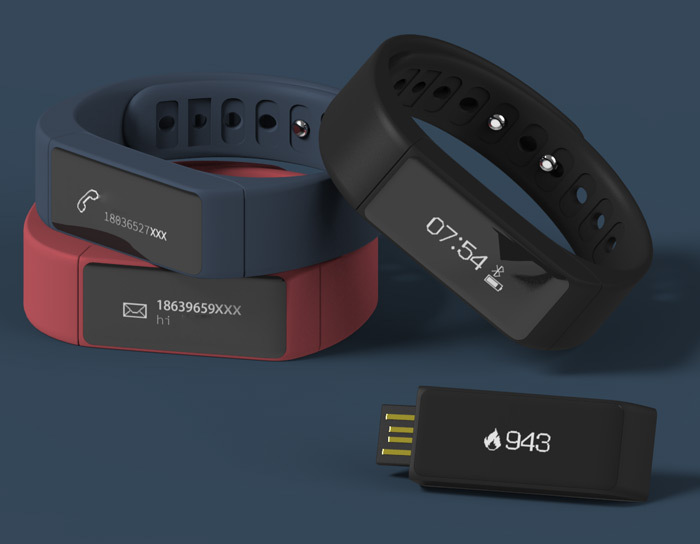 It will take 1 – 2 minutes to sync data for the first time. Data synchronism can be done manually by clicking the refresh button on APP too. 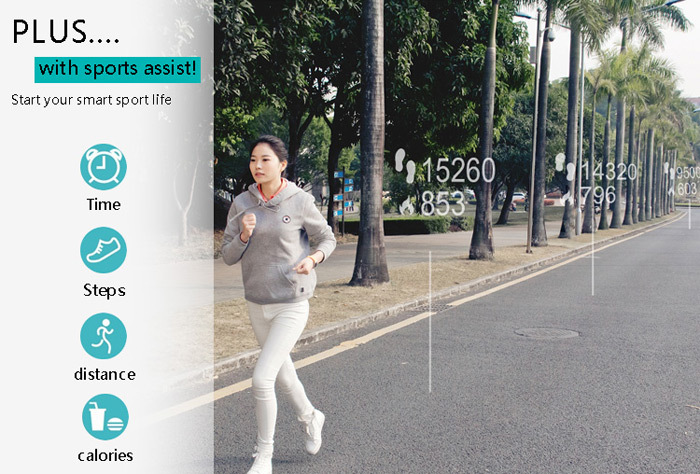 Sports tracking It can be used as a tool to avoid insufficient or excessive exercise by measuring calories consumption based on collected data, such as number of steps, distance, speed, time etc. to control exercise. 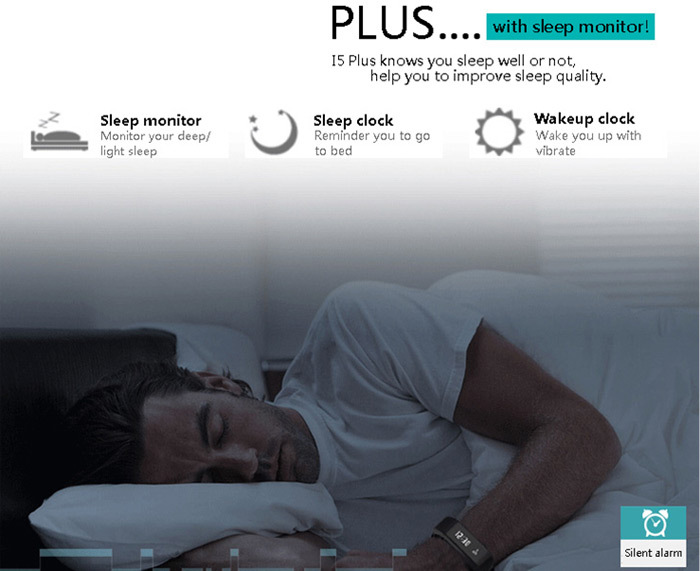 Sleep monitor Start sleep mode: The bracelet will distinguish if the wearer is sleep or awake everyday time 20:00 to 09:00, if the wearer sleep, then the bracelet will start sleep monitor mode automatically. 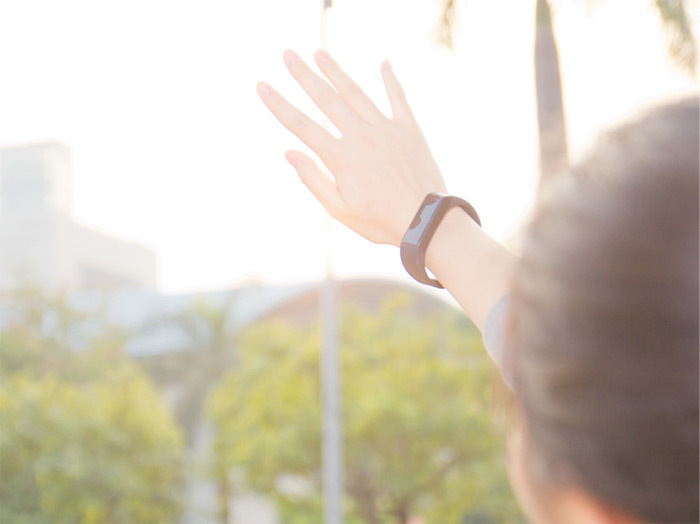 Exit sleep mode: When the wearer awake and move around 1 minute, the bracelet will exit sleep monitor mode automatically and back to time display. 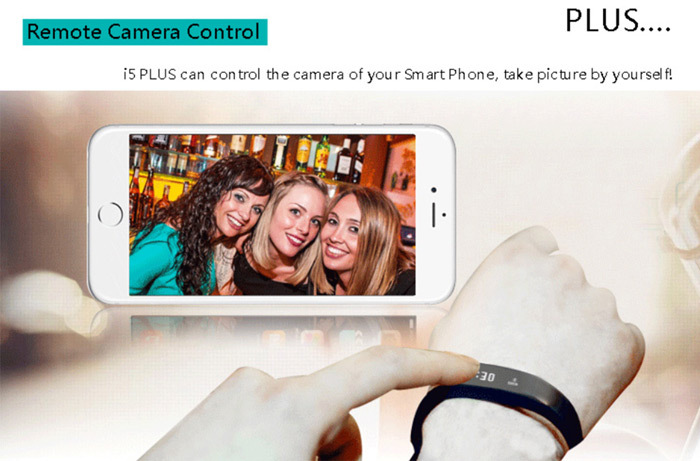 Remote camera You can control the camera of you cell phone to take pictures. Call and message reminding When a call or message is coming, you can check it without taking out of your mobile phone. 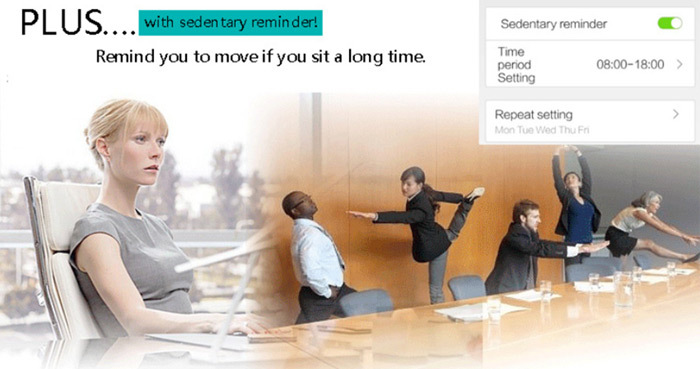 Sedentary alerts Many office workers often sit for eight hours, causing physical overload. The watch especially added sedentary alerts function. When you sit down and start to work, turn on this feature, select a specific working time. Until the time comes, the watch will automatically send reminders to prompt the owner of that the status will be a break up. 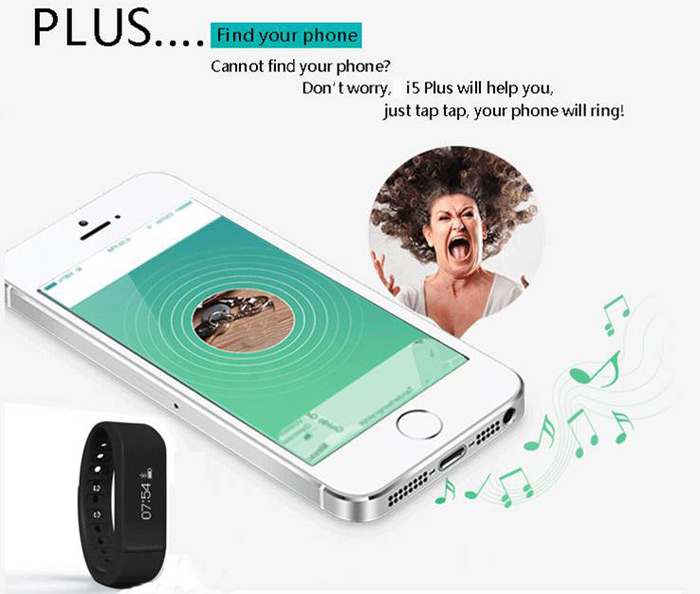 Find your phone When the function is turned on, your mobile phone will ring or vibrate when the distance between smart watch and phone is a certain distance. 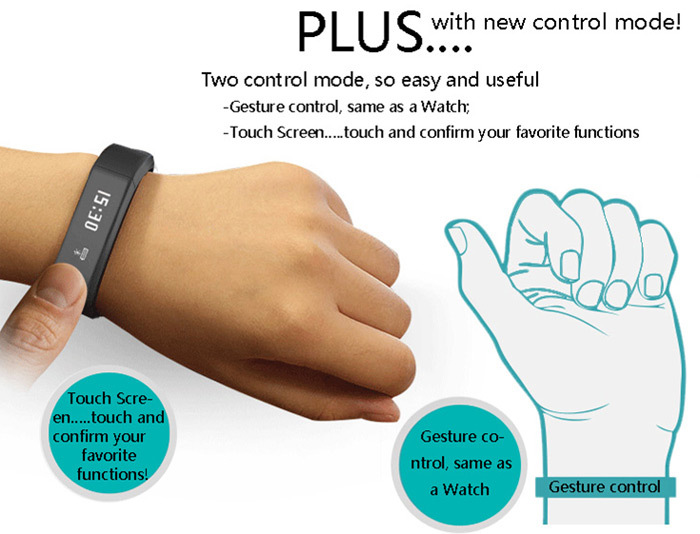 Bracelet operating instructions You can use the bracelet by Gesture Control or Touching the Screen. 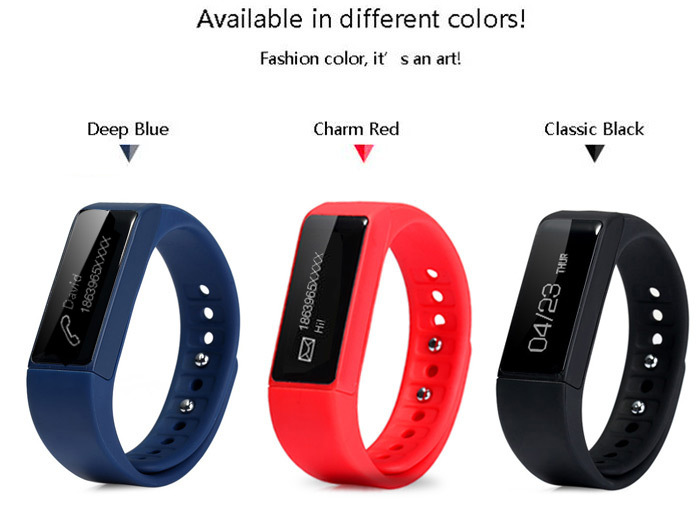 It is convenient to check the time by wrist gesture. 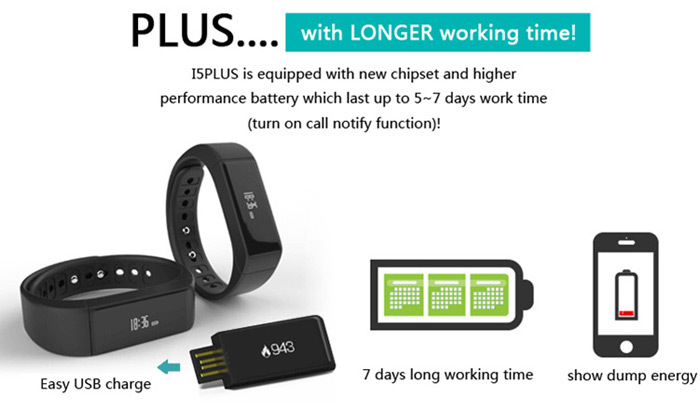 Questions and Answers 1.Q: When connected with App, the data synchronism is finished but the bracelet time display is still incorrect? A: Reset the bracelet and try data synchronism again. 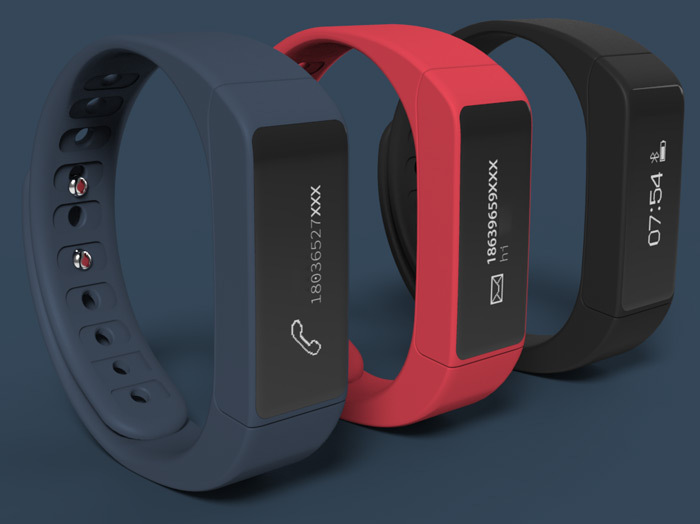 2.Q: After the bracelet connected with APP, why the bracelet didn’t show call ID when the call coming? A: Android phones: After connected with bracelet with APP, please allow Zeroner to visit calls, SMS, contacts and keep Zeroner running in background. If there are security software on your phone,set the software Zeroner as trust; iOS phones: If your phone is iPhone, please restart your phone and connect the bracelet again.When connect please wait until the phone pop up Bluetooth pairing request and click Pair, the call ID display function will come. 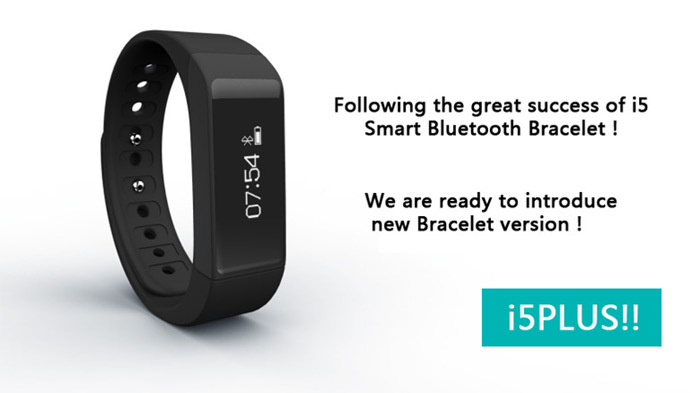 3.Q: The bracelet icon shows the Bluetooth was connected, but the APP cannot sync data? A: Generally it is caused by the Bluetooth of the phone. 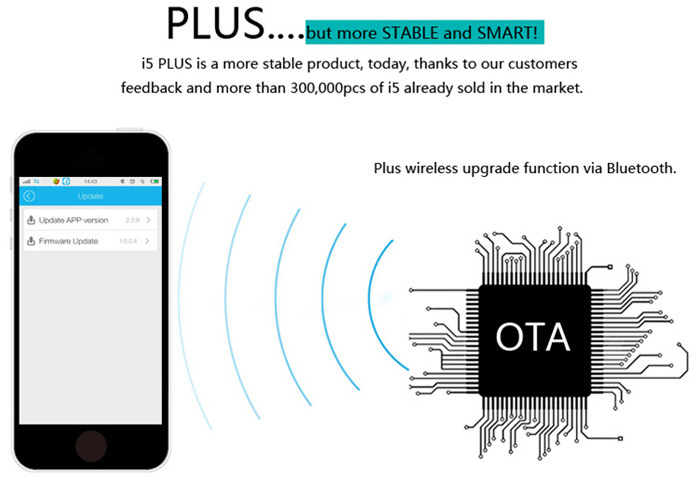 Please switch off the APP firstly, restart the Bluetooth and repair. If the above step does not work, please restart your phone and try again. 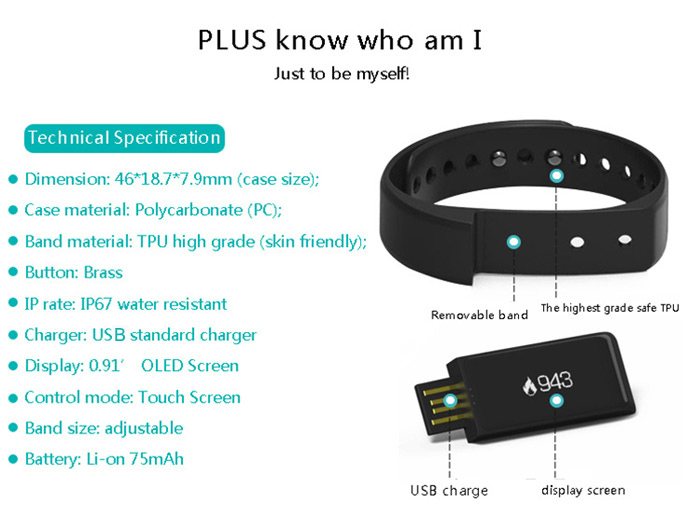 4.Q:Why my bracelet lose connection with my phone frequently? A: Please check if your phone or other security software sets Zeroner as trusted APP or not. If not, please set it as trusted APP and try again.